Set of 8 Skull shot glasses. Please note that these are shot glasses and not regular glasses. Shot glasses are small. Each of these glasses hold 74ml liquid. 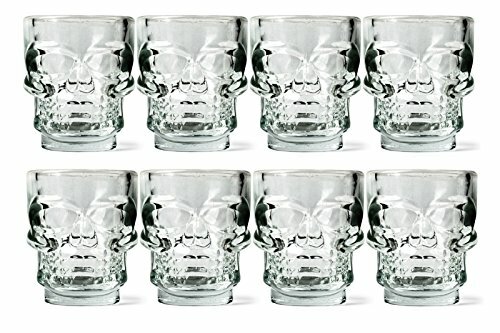 Set of 8 Unique Double Walled Skull Shot Glasses - Features/Specifications: Each set brings you 4 individual glasses. Double layer design and embedded skull shapes. Holds 2.5 ounces (74ml) per glass. This super skull head glass is mysterious, which Mayan legend claims has the power of lie and death, the power to heal or to smile, the power to create miracles. We make no claims beyond these: This glass will help you add the magic of a party. Don't blink. If you have any questions about this product by AJJU, contact us by completing and submitting the form below. If you are looking for a specif part number, please include it with your message.